Arachnophobics: beware! If you're scared of spiders, Liverpool city centre is best avoided today, with French company La Machine's 50ft mechanical spider expected to "wake up" this morning. 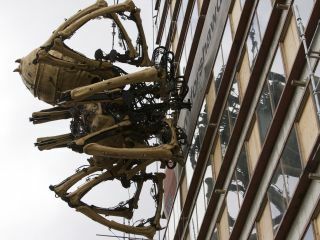 The 37-tonne arachnid will descend from its current position near Liverpool Lime Street station, where it has been clinging to the side of a nearby office block, before sinisterly crawling the city's streets. The £250,000 spider, which spans three storeys, has been greeting commuters to the station all week. The beast marks the beginning of a five-day piece of street theatre as part of the city's European Capital of Culture program. In other odd tech-related news, a small Swiss company, Algordanza, is taking the concept of mourning jewellery to new levels. It's offering its clientele the opportunity to remember their dearly departed – as diamonds, Reuters reported Monday. For a mere £4,000, you too could be wearing your nearest and dearest. The company converts the ashes of donated corpses into artificial diamonds by subjecting the carbon to huge pressure and temperature. Bobby Thurman decided to have a diamond made from combined samples of his own and his family's hair. "My family will cherish this diamond for generations, and I expect other families will want to do the same," Thurman said. You can't argue with fact (although taste is questionable): the company is currently making around 60 a month. Our intrepid search for the week's most pointless gadgets leads us to a pair of one-megabit cufflinks from Eprom. Could this be geek chic at its finest? We'll let you decide. Meanwhile, the USB anion humidifier soda can does much of what you'd expect from a humidifier these days: it cleans the air around you, re-energises your work-weary body, and looks like a… you guessed it: soda can. Are you frightened by planes? Does flying make you fearful? If you're one of those people who can't even catch sight of a plane without dropping a few Valium, you'd better stock up… From the first quarter of this year, Avidyne will begin delivering its MLX two-way Datalink Transceiver.